When it comes to entertainment, Hispanics love variety, and even more when it comes in the form of online video. On average, they visit nearly nine different sites, apps and services to view this content over a 30-day period. This presents a huge opportunity for marketers to implement a multi-pronged digital content strategy, where language can strategically be used across multiple touch points. Also, content that speaks to their heritage is popular with Hispanics, whether or not they’re fluent in Spanish. We often hear the second-generation saying, “No soy de aqui, ni soy de alla,” which means “I’m not from here or from there” — they feel caught in between two cultures. Content needs to be tailored to their specific interests. This might mean use more ads in English, but with a stronger cultural or emotional connection — memes that play on cultural experiences or videos that poke fun can be very effective, and we see this more and more from people sharing on social media. Whomever the audience, show relatable scenarios and tug at the heartstrings. Here’s some music to your ears: Hispanics are very receptive to advertising; in fact, over half of millennial Hispanics actually welcome advertising targeted to them as a Hispanic. So what’s the catch? Marketers need to offer a true reflection of what it means to be Hispanic — that speaks to both Hispanic traditions and American culture. Avoid “Hispandering” — content should be highly curated and focused on cultural identity beyond just language. The use of stereotypes can be comical, but should be done properly, else they will backfire. Our third-generation study showed “Latin-style dancing” was the least important advertising element indicated by respondents. Today, the multi-faceted Hispanic consumer is widely recognized as a cornerstone of any growth initiative for virtually all U.S. industries, and for good reason. With 57 million Hispanics in the U.S. alone, this group now represents almost 18% of the country’s population and significant spending power. In fact, Hispanic buying power reached $1.4 trillion in 2016—and we expect it to reach $1.8 trillion by 2021. 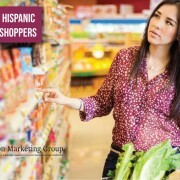 Despite concerns around the current economic and political landscape, Hispanic spending continues to rise across the total fast-moving consumer goods (FMCG) market, according to Nielsen’s Target Track retail measurement service. In year-to-date (YTD) 2017, Hispanic consumers have increased their FMCG spending by 0.6%, compared with 2016. In comparison, non-Hispanic dollars sales are 0.7% lower than last year. However, drilling down into individual departments paints a slightly different picture in four of the 15 departments. 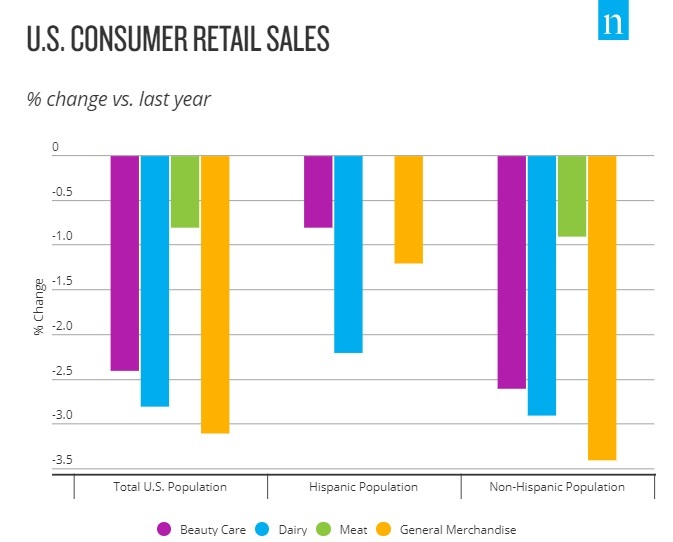 Sales in the beauty, dairy, general merchandise and meat departments are lower YTD for both Hispanic and non-Hispanic consumers. 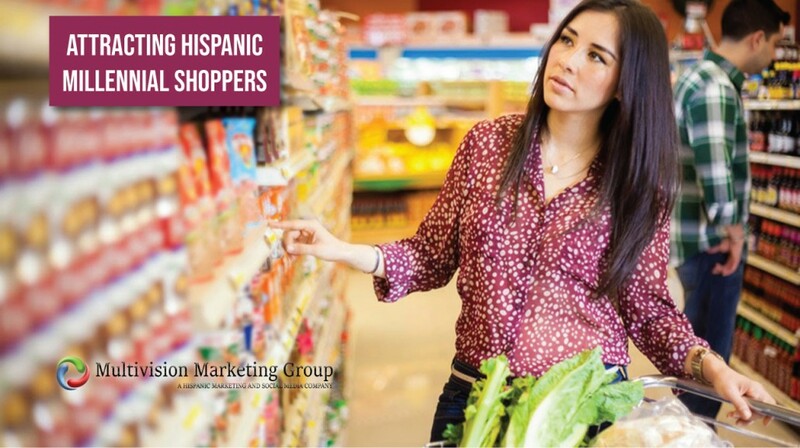 Hispanics, however, are spending more in several key departments that non-Hispanics are pulling away from, including bakery, deli, frozen foods and household care. It’s also worth noting that sales among non-Hispanics are not growing in any department where Hispanic spend is down. Despite shifting spending patterns, Hispanic consumers are not spending less than in previous years. At the same time, however, they’re not increasing their spend at the rate that retailers and manufacturers have become accustomed to in recent years. Across 10 of 15 key departments, YTD sales growth among Hispanic consumers are lower than they were last year. Comparatively, YTD spending among non-Hispanics is down across 12 departments. 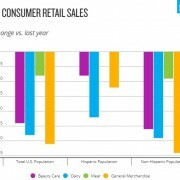 Hispanic consumers’ overall spending has increased this year. And as Hispanic consumers drive growth, the uptick in spending is helping to partially offset the spending declines among non-Hispanics. FMCG manufacturers and retailers should note that while Hispanic consumers are continuing to spend money, they are adjusting their shopping behaviors. For example, they’re shifting to larger basket sizes per trip, suggesting the need for manufacturers and retailers to ensure that larger product formats (i.e., family size) are available to meet a growing demand. By understanding the cultural essence that drives multicultural consumer behavior today, marketers and advertisers can forge a long-term relationships with the most dynamic and fastest growing segment of the U.S. consumer economy.